The recently announced €55 million project to upgrade the road infrastructure from Saqqajja Hill in Rabat all the way down to Mrieħel bypass fails to provide safe and attractive bicycle infrastructure that would encourage people to seriously consider cycling as an alternative option to their private vehicles. While it has been noted that extreme effort and attention has been given to alleviate traffic, relying on the provision of more infrastructure for cars does not tackle the problem. The provision of infrastructure for alternative means of transport on the other hand should be given priority in any road design if as a country we are serious about reducing traffic through a modal shift. The Bicycle Advocacy Group (BAG) has identified shortcomings in the design of safe infrastructure for bicycles as part of such projects. Going through the already approved road designs, one can immediately note that the only two kilometres of bike lanes featured in the project are disconnected and not up to the standards used across Europe. Furthermore, the already too narrow 2 km bicycle lane that is being proposed will not be physically segregated from 60 km/h-plus traffic. Painted road markings allowing a very narrow space are a death-sentence for those wishing to commute along the route by bicycle. This is particularly relevant in Malta where the level of awareness by drivers about cyclists and their safety is still very low. For this to happen in 2018, when so much talk and effort is given to promoting alternative modes of transport for a variety of good reasons, is downright unacceptable. BAG is also concerned by the fact that no serious consultation with stakeholders has been carried out despite calls from their end for safe bicycle infrastructure to be included at the planning stage of any road project. It is clear in this case that the opportunity to raise official objections has been bypassed. The haste to carry out these interventions, costing millions of euro from taxpayers’ money, is also problematic. demonstrate that these outcomes hardly ever materialise in road widening projects. interventions, costing millions of euro from taxpayers’ money, is also problematic. car, leading to ineffective quick-fix measures. 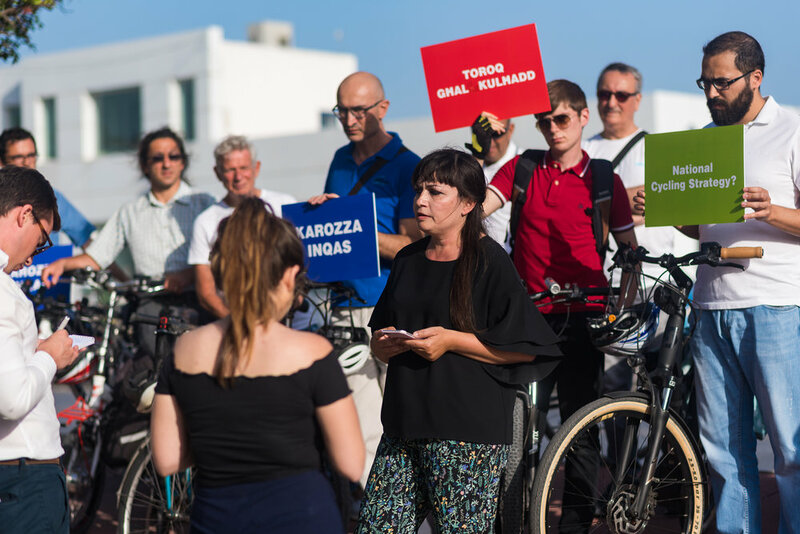 Kappara flyover, the Marsa junction project, and now also the Santa Lucija tunnel project, whereby bicycle infrastructure is being sidelined to accommodate just the car, leading to ineffective quick-fix measures. In a current affairs programme on TV, the Minister for Transport, Infrastructure and Capital Projects – Hon. Ian Borg has been reported as saying that the Government will not be restricting car use and that the change to alternative means has to be voluntary. BAG affirms that this shift will be impossible without safe infrastructure for those wishing to transfer to alternative and cleaner means. Such a passive approach indirectly encourages, and in some cases forces, more people to use cars for their mobility needs. t is important to mention that in its recent Country Report (2018) the European Commission has noted, once again, that the increase in car usage is negatively impacting our wellbeing and air quality and that the current strategies fail to set clear targets for the reduction of greenhouse gas emissions from transport . So long as no measures are being developed or implemented to drastically reduce car usage, these projects will only serve to encourage the use of the car and the deterioration of our environment and quality of life. have been taken into consideration in the design. As a case in point, The National Cycling Strategy has still not materialised, despite being promised last year. The lack of political will is worrying, and contrasts sharply with the measures being implemented all across European and global cities. across European and global cities. The B.A.G. committee and its members have noticed, over the past months, a positive increase in bicycle use with people showing the enthusiasm and interest to commute to work by bicycle. The introduction of the pedelec (ebike) also gave an important leap forward encouraging people to change their commuting habits. People that have recently purchased pedelecs are commuting from Ħ’Attard to Valletta in 18 minutes during rush hour, and 25 minutes from Rabat, despite the lack of infrastructure to do so safely. Yet, BAG still acknowledges that the lack of safe infrastructure to cycle remains the biggest barrier for people to take up cycle commuting, particularly the persistence of new projects that keep ignoring alternatives and reinforcing the status quo of car dependence. Unless a serious planned network of bicycle lanes and corridors are built, people cycling on a daily basis will remain negligible in number and vulnerable. Keeping in mind that the travel to work journeys are relatively short and could be easily covered by active modes (walking and cycling) if the infrastructure exists, such measures can have positive impacts on our wellbeing and society at large. BAG will be presenting a proposal incorporating 30 km of bicycle lanes, paths and bicycle-friendly streets effectively linking the seven towns and villages, potentially encouraging thousands of people to make the shift. BAG makes a plea to the authorities to design streets for people, and not promote and prioritise machines over our social wellbeing, safety and environment for short-term gains.